Abstract: The discovery and development of first antibiotic in 1920’s led to significant improvement of effective therapies for human health. Unfortunately, together with increased number of new antibiotics, the number of pathogenic bacteria resistant to antibiotics have gradually increased. There are two main mechanisms of acquiring antibiotic resistance: mutation or horizontal gene transfer (HGT). Current research demonstrated that quinolone (qnr) and polymixin (mcr-1) resistance genes are present on plasmids originated from aqua and agricultural communities non-related to clinical environment, suggesting that the origin of antibiotic resistance comes from natural environments. The mechanism of action of antibiotic is well studied, however the understanding of expression of antibiotic resistant genes on level of non-coding RNAs still remains unknown. The metatranscriptomics analyses of RNAs in microbial communities revealed significant amount of double stranded RNAs that do not match any known DNA databases. This study would lead to understanding of dynamic shifts in gut microbiota (particularly in dsRNAs) and highlight the key regulatory pathways and novel structural genes responsible for microbial adaptation to antibiotic treatment. Results from this research would be directly relevant to RNA virology by discovery of uncharacterised dsRNA in bacterial communities. It will shift current knowledge about antibiotic resistance and allow prediction of regulatory pathways of AR resistant genes. Results from this research have significant potential for pharmaceutical industry in developing novel strategies and designing new generation therapies (antisense RNAs or novel RNA-based drugs) to target antibiotic resistant bacteria. 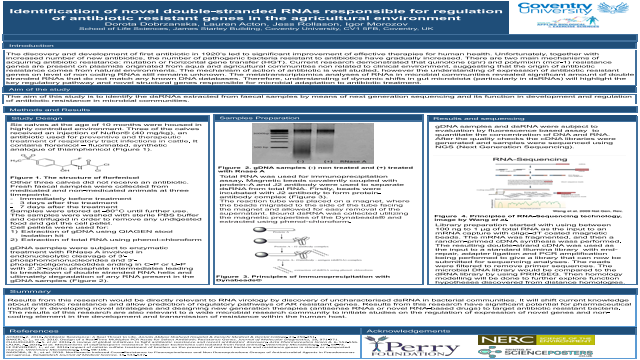 The results of this research are also relevant to a wide microbial research community to initiate studies on the regulation of expression of novel genes and non-coding element in the development and transmission of resistance within the human host.Summary: Results from this research would be directly relevant to RNA virology by discovery of uncharacterised dsRNA in bacterial communities. It will shift current knowledge about antibiotic resistance and allow prediction of regulatory pathways of AR resistant genes. Results from this research have significant potential for pharmaceutical industry in developing novel strategies and designing new generation therapies (antisense RNAs or novel RNA-based drugs) to target antibiotic resistant bacteria.References: AHMED, Z. 2016. Antibiotic Resistance: A Real Threat to Life. Annals Abbasi Shaheed Hospital & Karachi Medical & Dental College, 21, 250-251. BAKER, C. L., et al. 2016. Design of a Real-Time Multiplex PCR Assay for Select Antibiotic Resistance Genes. Journal of Molecular Diagnostics, 18, 971-971. CHAUDHARY, A. S. et al. 2016. A review of global initiatives to fight antibiotic resistance and recent antibiotics' discovery. Acta Pharmaceutica Sinica B, 6, 552-556. LALAK, A., 2016. et al. Mechanisms of cephalosporin resistance in indicator Escherichia coli isolated from food animals. Veterinary Microbiology, 194, 69-73. LE DEVENDEC, L., et al. 2016. Impact of colistin sulfate treatment of broilers on the presence of resistant bacteria and resistance genes in stored or composted manure. Veterinary Microbiology, 194, 98-106.